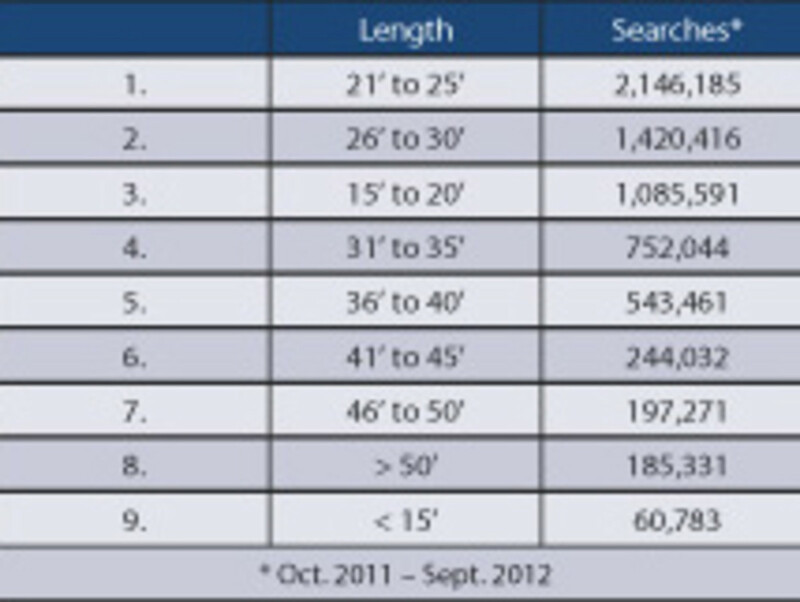 Of those searches with length specified, the most common by far were in the 21- to 25-foot size range, followed by 26 to 30 feet and 15 to 20 feet. After that, the frequency of search followed the size of boat from 31 to 35 feet on up. Fifty percent of all searches were in the range of 19 to 27 feet, and the median boat length searched was 26 feet. After due analysis we found an interesting correlation between these numbers and leads that visitors sent and we’re using the term “two-foot-itis” to describe it. The term is usually applied to the itch boat owners get to buy a new boat that’s two feet longer. In our study we found that visitors send leads for boats that are, on average, two feet shorter than those on which they search. As evidence, we offer the fact that 50 percent of all leads sent to sellers by Boat Trader shoppers were for boats 17 to 25 feet, and the median length was 24 feet.